1. How much does Canada spend on its military? 2. What do Conscientious Objectors want to achieve? 3. Is there any precedent for Conscientious Objection to Military Taxation? 4. How can I express my objection to Military Taxation to the government? 5. What happens to the money deposited in the Peace Tax Trust Fund? 6. What will be the legal consequences if I redirect the military portion of my taxes? 7. What do I do if I receive a notice of collection from the Canada Revenue Agency? 8. Isn’t Canada’s military budget for peace-keeping purposes? 9. Everyone’s taxes are mixed together. Isn’t your proposal just cosmetic? 10. How would we stop the Hitlers of this world without war? 11. How can I support Conscience Canada’s work? Public Accounts for Canada in fiscal year 2017-18 can be found here. Each year conscientious objectors are faced with a dilemma: whether to comply with the current tax law of Canada, knowing a portion of their taxes pays for the military, or whether to follow their conscience, which opposes support for warfare. We seek legislation which would resolve this dilemma by allowing the military taxes of conscientious objectors to be deposited into a special government account and then spent only for non-military peace and security initiatives. This provision is practical and simple to administer. As well, it would bring the Income Tax Act into compliance with the Charter of Rights and Freedoms’ guarantee of freedom of conscience. Canada has respected conscientious objection to military service on religious grounds since 1793. There are already Canadian precedents for recognizing conscientious objections to paying for the military. In 1841, conscientious objectors to the militia tax were allowed to redirect these taxes to public works. In the First and Second World Wars, conscientious objectors to war bonds were allowed to buy a special series of government bonds (“peace bonds”) whose proceeds were used only for the relief of suffering caused by the war. During times of military conscription, alternative non-combatant service has been arranged for Canadians who cannot participate in war for reasons of conscience. Today war is heavily technologically driven and extremely expensive. Tax dollars, rather than citizens, are the focus of conscription. Therefore our conscientious objector laws need a “technological update”. You can discuss this issue with your MP, whether in writing or in person. During income tax time, the Peace Tax Return, produced by Conscience Canada, can be used in conjunction with your official Canada Revenue Agency tax return to state your objection to military taxation. Part A of the Peace Tax Return is for those who pay no income tax at all, whose tax is deducted at source or otherwise paid in full, or who have a refund owed to them. Part A may also be used by anyone not wishing to withhold or divert any part of their taxes, but still wish to state their objection to paying taxes to support the military war machine. Part B of the Peace Tax Return is for those persons whose principles/conscience direct them to withhold or divert the percentage of their taxes that contributes to military spending. The military portion – or a symbolic portion – of their taxes can be directed into Conscience Canada’s Peace Tax Trust Fund. 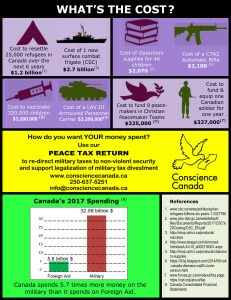 Since 1982, Conscience Canada has maintained a Peace Tax Trust Fund in which peace trusters have deposited the military portion of their taxes as a protest against paying for war. Until a CO Bill has passed into legislation, Conscience Canada provides a positive option for Conscientious Objectors to Military Taxation (COMTs) to deposit the military portion of their federal income taxes into a Peace Tax Trust Fund as a formal objection to paying to kill. The money is held in trust and will be returned upon request, for any reason. Since the Canadian government does not currently recognize conscientious objection to military taxation as a legal right, withholding or diverting taxes due is likely to result in a variety of responses from the Canada Revenue Agency (CRA). 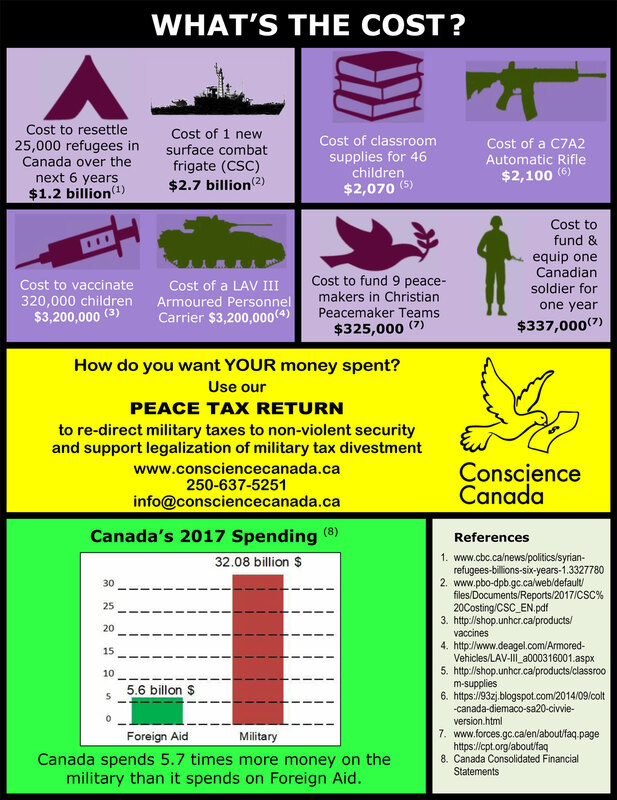 By using either Part A or Part B of Conscience Canada’s Peace Tax Return you send a message to the Canadian government that you want your taxes to be used for peace, not war. The money deposited in this account does not belong to Conscience Canada, but to the Conscientious Objector to Military Taxation (COMT) who has deposited it. We are working towards legislation that would allow COMTs to transfer their funds into a ‘peace building’ or a ‘peaceable’ account established by the government. In order to simplify bookkeeping, individuals who deposit money in the Peace Tax Trust Fund will not accrue interest – any interest accrued on funds in the account will be used for third-party auditing of the fund or for the operating costs of Conscience Canada. The original amount of money you deposit into the Peace Tax Trust Fund is held in trust for you and can be returned to you at any time upon your request (for any reason). The Canadian government does not currently recognize conscientious objection to military taxation as a legal right. The Canada Revenue Agency (CRA) will endeavour to collect all taxes owed (including the military portion of taxes), interest on any amount owed, and possibly fines for late payment. Conscience Canada’s Peace Tax Trust Fund offers a way for conscientious objectors (COs) to divert their war tax to a safe holding place. At any time your money can be returned to you by Conscience Canada. A notice of assessment is usually received a few weeks after sending in your tax return. A sum approximately equal to the sum sent to the Peace Tax Fund is identified as tax owing. For considerable sums – usually of more than two hundred dollars – the Conscientious Objector to Military Taxation (COMT) is notified of the option of filing a notice of objection to the assessment. (This is an opportunity to explain your actions and to document the explanation). Some weeks or months later the COMT receives a notice confirming or altering the assessment; usually CRA confirms their assessment of tax owed the government. At this point CRA usually offers the option of appealing to the Tax Court of Canada. Several taxpayers have done this in the past using this opportunity to further inform officials, but so far the courts have ruled against them. If the COMT does nothing, several months later he or she may receive notice that the CRA will take legal action. In the past, this consisted of garnisheeing income from wages or pensions, or seizing money from bank accounts. There have been occasions when the CRA has followed some of the above steps and then for no apparent reason, just stopped. This has often occurred where the money owed is less than $200. There have been no instances, of which we are aware, of the seizure of property or laying of charges or fines for late payment. At any point in this process you may wish to consult a lawyer about your options. It is to be noted that for lesser sums, the amount owed may simply be deducted from one’s GST refunds or indeed any other refund. Conscience Canada’s network of COs provides a place for people to share information and receive moral support. It is good to recall that at any time, at your request, the money you placed in the Peace Tax Trust Fund will be returned to you by Conscience Canada. A web or telephone search will provide specific names and addresses. You may also find it beneficial to personally contact your employer or bank manager to explain your position. Should you at some point find it helpful to consult with a lawyer to find out what your legal options are, Conscience Canada may be able to assist in finding a lawyer who is sympathetic to conscientious objection. Please keep Conscience Canada informed with regard to all developments. While taxes are indeed mixed together in the hands of government, at the time we pay our taxes we have individual responsibility for that money. Conscientious objectors find it impossible to pay those taxes which they know are paying for war or preparations for war. Rather than paying a military tax, conscientious objectors would be paying a tax for security assured through peace initiatives, including early detection and de-escalation of potential conflicts and training in peacemaking and peaceful resolution of major conflicts. While we respect Parliament’s prerogative to set government policy, we want to share our vision of a profound change in the way international conflicts are resolved. We are asking that Canada move towards full conversion from military to civilian defense, and shift the focus to non-violence, to conflict prevention and addressing underlying causes and reasons for conflicts. Such a conversion is in no way cosmetic. The question assumes that the only sure resistance to a tyrant is military power. However, there are many examples of the success of non-violent resistance against totalitarian regimes. When the Nazis ordered the deportation of Jews from occupied Denmark in 1943, within days almost all Jewish Danes were hidden and eventually transported to safety in Sweden. Non-violent resistance in Poland, and later in East Germany, was instrumental in the liberation of Eastern Europe from Soviet rule during the 1980s. In the Philippines in 1986, when Marcos rigged elections, half a million people came into the streets to protest, his army refused to attack, and he fled. In the last two decades “people power” has been used successfully to bring down undemocratic regimes in Georgia, the Ukraine, Serbia, Egypt, Tunisia, etc. In each case there was suffering during the period of non-violent resistance and the outcome was uncertain. However, the outcome of military intervention is also uncertain and in the process creates great suffering, and does not address the conditions that allow fascist leaders to rise to power. Moreover, the destruction of civil infrastructure and the trauma that results from war further erode the capacity of the general public to build democracy and oppose fascism. The weapons of mass destruction used in wars in the 20th and 21st centuries mean, at best, the slaughter of a large number of civilians as a result of war. At worst, we face “mutually assured destruction” (a doctrine of the Cold War nuclear standoff) and the end of life on earth. We have been willing to take enormous risks by relying on violent defence. Why then are we unwilling to take risks with non-violence? There is a new academic field of peace studies in peacemaking and non-violent conflict resolution, which demonstrates that while violence sometimes brings about rapid change, it is rarely lasting change, and damages both those attacked and those forced to kill. Martin Luther King Jr. said, “The ultimate weakness of violence is that it is a descending spiral. Instead of diminishing evil, it multiplies it… Hate cannot drive out hate; only love can do that”. Canada could become a leader in non-violent resolution to major conflicts by initiating a government sponsored civilian peace service trained specifically for peace-making activities throughout the world. Recommended reading: Force More Powerful: A Century of Nonviolent Conflict by Peter Ackerman (2001) documents how popular movements have used non-violent means to overcome oppression in the US, India, South Africa, Denmark, Poland, and Chile. In The Politics of Nonviolent Action, author Gene Sharp outlines 198 individual, collective, and government strategies that can be used to bring about social change without having to kill. There are many ways people can make a positive contribution to peace. On our “Initiatives” page we suggest redirecting the military portion of your taxes to Conscience Canada’s Peace Tax Trust Fund, writing politicians, educating people about military taxation, and becoming involved in the growing community of conscientious objectors to military taxation. You can directly support Conscience Canada by becoming a voting member, volunteering and/or by making a donation. Conscience Canada is a non-profit group. Overhead costs are kept low by donation of labour by volunteers working from their homes. Donated funds can therefore go directly to our education and advocacy campaigns (e.g., publication of the Conscience Canada newsletter, circulation of petitions calling for legislative reform) as well as to special projects and participation in peace conferences. Becoming a voting member is free of charge. To become a voting member, send us an email: info@consciencecanada.ca.